Many said that your visit to Penang is considered incomplete if you did not try out Assam Laksa in Penang. Yes, it is a bowl of soup noodle with broth made of mackerel, tamarind, chili, Vietnamese mints (laksa leaves), and ginger buds to name a few. 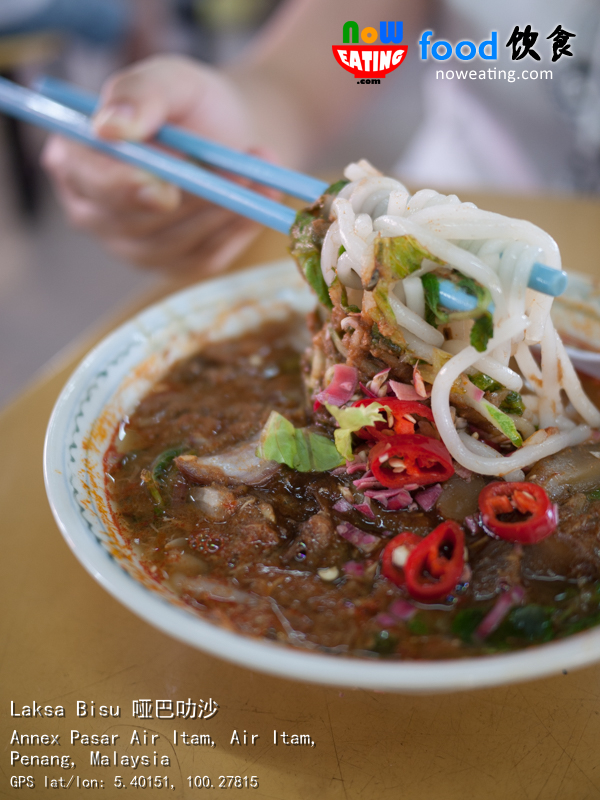 One of the famous spots for Laksa in Penang is in Air Itam town. 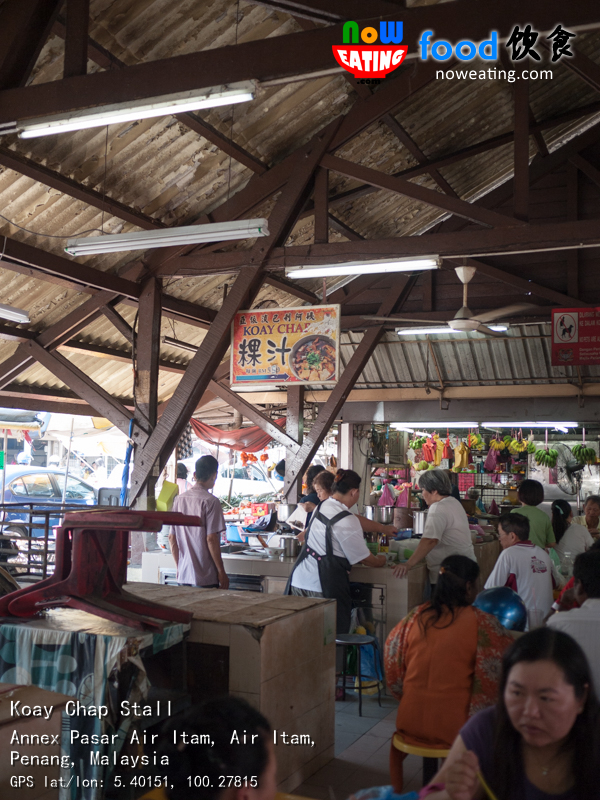 For many tourists, they will flock to the Laksa stall at Air Itam wet market corridor, on the left side of the one-way street. The Laksa is also known as “tourist laksa” with mild and plain broth suitable for first timers. 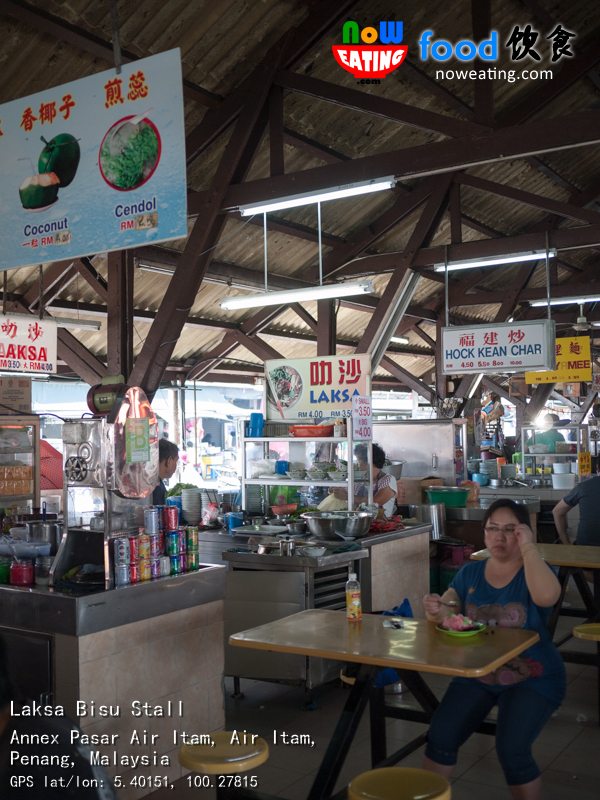 For locals, they usually patronize another Laksa stall just opposite of the “tourist laksa”, inside Air Itam Market Annex Food Court. The laksa in annex is available in the afternoon. 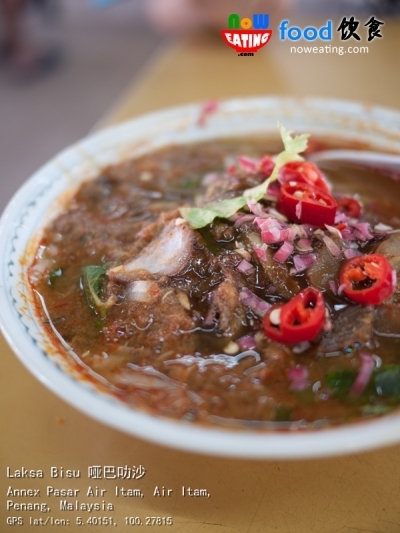 Perhaps a reason it is not as famous as the “tourist laksa” is because the owner is muted. Yes, the laksa is also called Laksa Bisu 哑巴叻沙 (Bisu is a Malay word meaning “muted”). Personally, we preferred the laksa inside the annex as it had thicker broth and more like a real Penang Laksa suitable for Penangites who have stronger taste buds. A rule of thumb to determine whether a Laksa will taste good or not is to walk nearby the stall. If there is no smell of laksa, then you better order something else. Also available in the afternoon is a Koay Chap stall. It is told that it is the first Koay Chap stall in Penang (since 1928) and is handled by third generation nowadays. 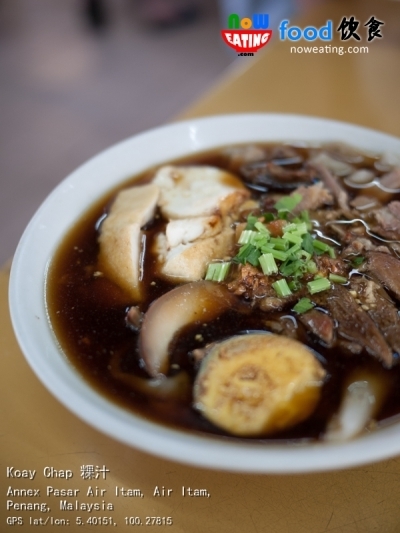 Today, a more popular Koay Chap is at Kimberly Street of George Town operated by another owner. 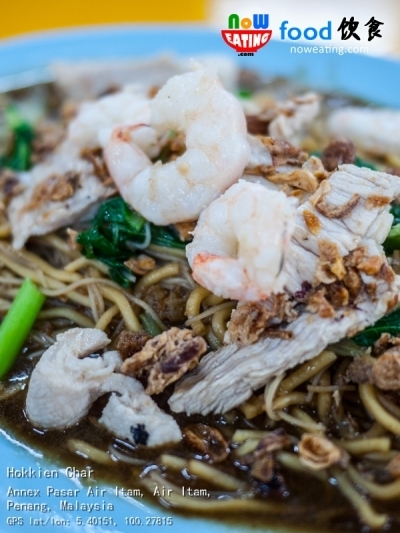 Personally, we prefer Koay Chap in this annex. A bowl of it costs RM5.50. Similar to Kimberly Street’s, it has generous amount of duck meat and innards, with an exception that it is less “political” here. At Kimberly Street’s shop which is usually crowded with tourists, occasionally we found that the staffs were rude, impatient and would stare at you if you bring food from other stalls. As a consumer, we definitely will not spend our money to “enjoy” this kind of service. A drawback for Ait Itam Merket Annex is that it can be quite humid in the afternoon, especially if you are sitting nearby Laksa Bisu stall with boiling cauldron. We like to order a tall Sundae Cone (RM2.50) from Choy Kee Confectionery Shop near RHB Bank. 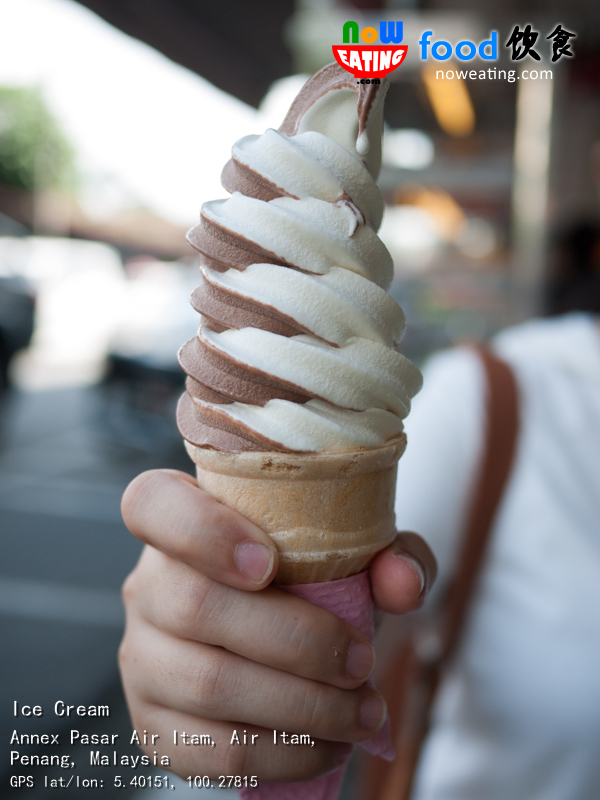 It has been many many years since we had one vanilla+chocolate sundae, especially after McD stopped selling this type of Sundae Cone decades ago. Air Itam Market Annex is also operational in the evening. In the evening, be sure to try the Hokkien Char – a stir-fried yellow noodle dish in savory soy sauce. Some said it is the best in Penang. The stall is just in front of Laksa Bisu. 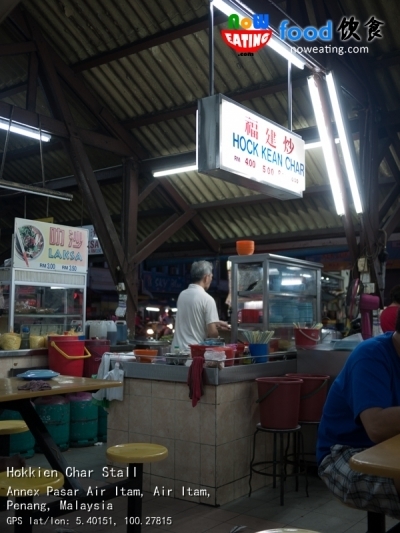 A plate of Hokkien Char starts from RM4.50, increased RM0.50 since we last visited it in year 2012. Yes, it is a plate of better Hokkien Char compared to other stalls with adequate amount of “Wok Hey” and toppings including prawns, pork, fried onion and Choy Sum. 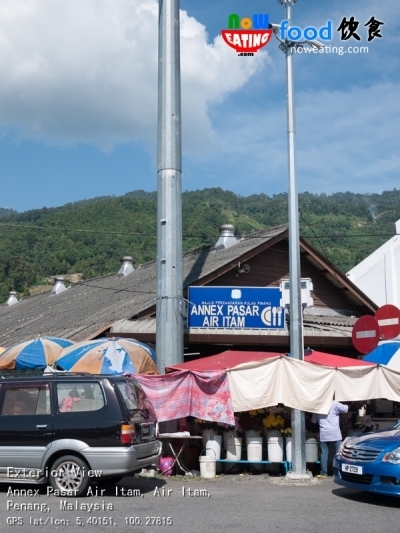 As a whole, if you are looking for locals preferred food, try Air Itam Market Annex Food Court.